The Hanpa Tec’unpi Warriors hand game team took second place at the Lakota Nation Invitational in Rapid City. Members of the team are Kristen Small, Nanette Eagle Star, Joslyn Felix, Jeslyn Felix, Serena Hardy and JaiWanda Roubideaux. The team beat out Crazy Horse in the first round, St. Francis in the second round, Pine Ridge in the third round to go undefeated but lost in the fourth round, beat Crow Creek in the fifth round to come off the losers bracket. Then Winner beat Little Wound in the sixth round. In the championship round Winner won one and lost one to Rapid City for second place. 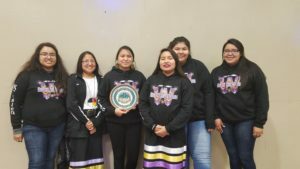 The Warriors also competed at the annual Flandreau Sioux Tribe Hand game tournament and won second place. The team will be competing in the Dakota Oyate Challenge on Jan. 26 in Huron.